Back Pain – Back pain caused by bad posture at work is one of the leading causes of long term sickness in the UK. 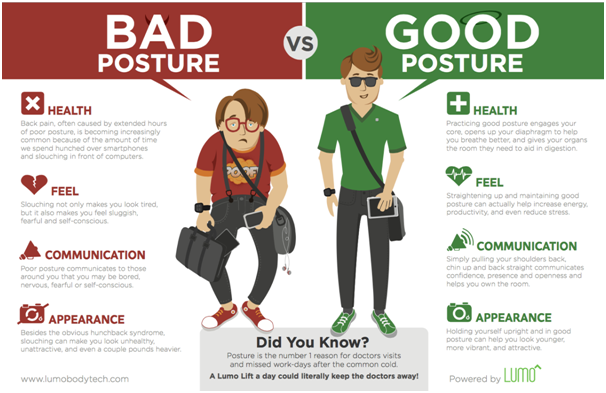 Slouching at the desk all day can cause the spine to become out of shape and cause pain, particularly in the lower back and tension in the shoulders. Try to do some back exercises and make sure that your posture is correct. Also evaluate your workstation, check how your desk and chair are positioned in relation to your monitor. Your screen should be at eye level and your feet rested flat on the floor. Have a look at your office furniture and chairs, https://www.easyofficefurniture.co.uk/Office-Desks-and-Workstations supply a range of office desks and chairs. Air Quality – In the 1990’s there were cases in the UK of legionnaires disease being spread through contaminated air conditioning. Too much recycled air isn’t good for anyone, and can be responsible for the spread of colds and coughs throughout workplaces. The best solution is, where possible have clean air from outside flow in so open a window and enjoy all that lovely fresh air instead! Stress – Stress is nearly as high as back pain for causing long term sickness in the UK. It is responsible for over 40% of workplace illness according to Health and Safety Executive (HSE). Pressure at work is one of the main reasons given, but also office bullying is a big problem. If you feel you have too much work to do, don’t feel that you have to say yes. Give the reasons clearly and confidently as to why you feel under pressure and offer a solution. If you are being bullied at work, speak up and seek help. Bullying is unfortunately as common at work as it is in the playground, and can put a huge amount of stress on the person being bullied. If you have a manager that you can confide in raise the issue with them, you should also have a HR representative that you can speak with, but please don’t suffer in silence – it won’t help you and the bully could have other victims too.